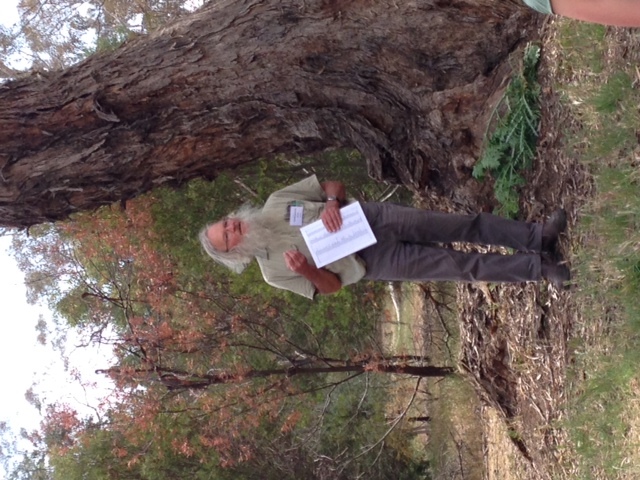 Sunday 25 October 2015 saw an interested group of small and large landholders, from within and out of the shire, gather in Newstead to learn firsthand about weeds from a knowledgeable group of presenters. David Cameron stresses that proper identification of weeds is essential. Senior Botanist David Cameron (DELWP), local contractor Matt McEachran (Bushtech), and local Landcarers Frances Cincotta and Maurie Dynon shared their considerable wisdom and practical experience to help participants learn to identify weeds and their spread and the most appropriate techniques to managing them, from herbicide use to re-vegetation with native plants. With the group naming and singling out the number one weeds on their own properties – including willows, hawthorn, blackberry, gorse, briar rose, bridal creeper, capeweed, oxalis and all manner of annual exotic grasses – the clear message of the day from the presenters was the importance of prioritising weeds as part of any management plan. This means dealing with the real baddies – the most invasive, the most persistent – and leaving the others alone, or to be dealt with at another time. We visited three different sites for comparison: the Newstead Rotunda Park, Jim Crow Creek and the confluence of the Muckleford Creek and Loddon River. Each site had it’s own story to tell – scroll down to the bottom of this page to read about Newstead Landcare’s work at the Rotunda Park and on the Loddon as generously shared by Newstead Landcare President, Frances Cincotta. 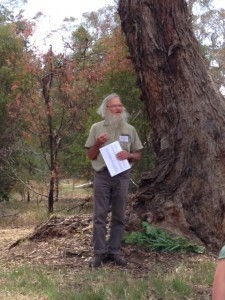 The successful restoration of Jim Crow Creek is an inspiring story achieved through the hard work of Maurie Dynon, the Guildford Landcare group and Shepard’s Flat Landcare. The clear message from Maurie was that much can be accomplished through… cups of tea! Positive engagement with all landholders, whether they are keen, uncertain, or skeptical, is the key to any kind of environmental restoration, and getting one landholder on board with a project is often the impetus for others to connect. Matt says is always important to first work out what it is you want to achieve and then come up with a plan of action. David Cameron provided a introduction to weeds, stressing the importance of proper identification of weeds which can in turn assist with deciding on appropriate management actions. He suggested a number of on-line databases that are available to help with getting to know your local area and plants including the Victorian Biodiversity Atlas, and the Australia’s Virtual Herbarium. David encouraged us to learn what plants we have, then work out which exotic species are environmental weeds, and of these which are the ‘transformers’. These plants will have a aggressive invasion front and will change the ecology of a location. These are the weeds that should be the focus of your attention. Click here for a list of some of the ‘transformer weeds’ commonly found in this area. 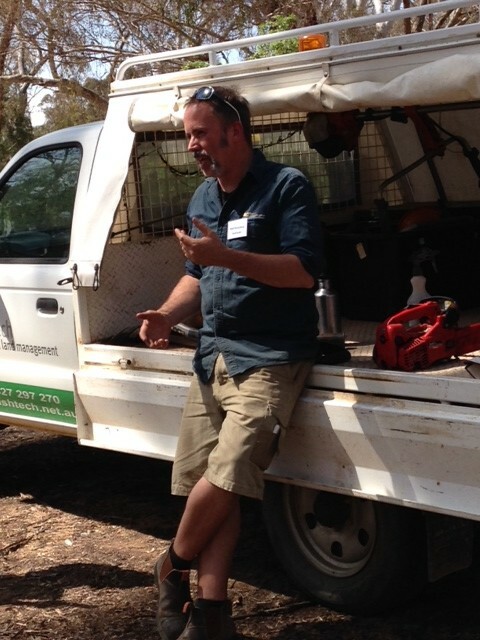 While David generously shared his incredible knowledge about the taxonomy, dispersal and life cycle of various weeds and their effect on the environment, Matt covered some the practicalities of control. Both presenters agreed that you need to use good taxonomy and knowledge of particular species, have a clear goal and strategic approach, and prioritise your weeds in order to focus your energy, time and resources. Yes, the bush can fight back, but it often needs a helping hand to do so through the management of weeds by chemical or mechanical methods. Adopting the Bradley sisters’ method – by working with the best areas first rather than the worst, or from the outside towards the center, participants were encouraged to think of their own properties in terms of zones of priority which instantly makes the problem more manageable. We have collated a extensive list of useful weed resources and website available on our weed resources page. David’s list of useful guide books can also be found on this page. To find out more about Landcare and our local groups, go to the Connecting Country Landcare Pages. For more information on Landcare across the Mount Alexander region, contact Max Schlachter, Email: max@connectingcountry.org.au, or phone: (03) 5472 1594 . Newstead Landcare Group formed in 1999. We decided as a group we’d only do planting on public land and this is the first site we adopted. It was a park whose assets were lovely eucalypts, a creek, and some wood on the ground, but no native shrub layer and not many local species in the ground layer. Blackberries, Box-thorn, Bridal Creeper and Cape Broom were the main weeds, and our first impulse was to remove them and replace them with indigenous shrubs. However we noticed that small native birds such as Blue Wrens were using the Blackberries and Hawthorn bushes for nesting in, so we decided not to remove the exotics until we had established alternative vegetation and these had grown big enough to be useful for nest sites – then we ‘cut and paint’ job on the woody weeds, using Roundup. We got a man with a tractor to rip the ground in curving lines. We sprayed the rip lines with Roundup before planting understorey species grown from seed collected from remnant vegetation within 7km of this spot, suitable for Creekline Grassy Woodland Ecological Vegetation Class. The main shrub you can see is Wirilda but we also planted a range of other shrubs along the creek including Silver Wattle, River Bottlebrush, and Blackwood. On higher ground we planted Drooping She-oak grown from remnants on private land just up hill from here, Sweet Bursaria, Golden Wattle. and the local Hakea. We didn’t need to plant any eucalypts as there were plenty here, but not many old enough to have lots of hollows – takes about 100 years to form hollows suitable for hollow dependant fauna so we worked with the local Primary School students to make nest boxes and erect them here and they are well-used by a variety of birds and possums. At one working bee we noticed an Owlet Nightjar sheltering under a log on the ground – these usually use hollows. This emphasized to us the importance of leaving some wood on the ground. It’s at odds with the whole “tidy towns” approach – this is a council ‘park’ rather than a ‘bushland reserve’ and the public likes to see lawn and trees, but lizards and lots of birds such as the Bush Stone Curlew that used to be found Newstead need the untidiness of fallen trees and branches. Our group is big on environmental education so in 2004 we erected an interpretative sign. The wildlife photos were taken by a local man Curly Hartup who died just before the sign was to be unveiled. His sons came to the opening and told us stories of skiving off school when river in flood and taking a lilo down the flooded Mia Mia Creek. The family have put on an exhibition of Curly’s nature photographs which is on at the Newstead Railway Station which has recently been reopened as an art gallery, open on weekends. We planted here each winter from 2002 to 2009. We used plastic guards with 4 hardwood stakes per plant. These are more expensive than milk carton guards, but you get a few uses out of them. Also they give the plants more room than a milk carton, more protection as they are taller, and stand up to the wind better. In the Mia Mia Creekline is a weed called Spiny Rush. There are many native Juncus species in our district but alas this Juncus acutus is from Europe and Asia. We attempted to kill a clump here and there and planted sedges in their place but soon realised that Mia Mia Creek flows through private land full of Spiny Rush before it gets to this park, so we are never going to be able to keep this stretch ‘clean’ of it. Anyway it’s dong a job stabilising the creekbanks. Our ongoing work here is pulling up Broom seedlings by hand, and we spray the Bridal Creeper using Roundup as it has a huge mass of rhizomes under each plants and it’s too hard to manually remove them all. Asparagus asparagoides is native to southern Africa (where a lot of our weeds come from). We have quite a big campaign on Bridal Creeper – we get grants for spray and backpack units and each member takes on to do a certain areas near where they live. In some cases of bad infestations such as Green Gully we paid a contractor to spray as it was head high. And we’ve followed up at that site with planting indigenous understorey species. We used to whipper-snip the annual grasses here, but we’ve found that now the shrubs are established the growth of annual grasses is much reduced as there’s less light and moisture available to for them. Since we finished planting here in 2009 and moved onto other areas of public land such as the Racecourse reserve on the other side of the river, the Rise and Shine Bushland reserve at Clysdesdale, Birkins Lane, along the Loddon between the ford and the bridge and the last 3 years we’ve been working on a site near the junction of the Muckleford creek and the Loddon River which you will be visiting later today. We are always looking to connect up fragments of bush to each other, and improving the quality of the bush. For example, we’ve planted uphill from here, along Mclarens Lane to connect the this park to the Muckleford forest. Our Landcare group always has a start of year barbecue here at Rotunda park to plan the year ahead, and one year as were were packing up at dusk we heard a trilling sound, got out a torch and there was a juvenile Powerful Owl come to thank us for our work at Rotunda Park! Here again there is no need to plant any eucalypts. The site has magnificent big old River Red Gum trees, but the ground layer was just weeds, mainly Oxalis (yellow flower) and thistles. The sheer volume of weeds at this site is fairly daunting! Newstead Landcare group decided to plant some understorey shrubs, grasses, sedges and Spiny-headed Mat-rush. We could not do rip lines here as there is an Indigenous Heritage overlay, and we didn’t want to disturb the roots of the old trees. We have planted 300 plants each winter since 2012, again using plants grown from seed collected within 7km of the site. We spot spray with Roundup before planting. The plants grew well in the first year, but Swamp Wallabies could just lean into the guard and browse on the plants! We never had this problem at Rotunda Park. So in the second year of planting we erected small fenced enclosures to plant in as the theory is that wallabies don’t like jumping into as small space. We hammered a few stakes in the middle of each plot to make it look even less inviting to jump inside. This has worked. We will shift the netting as plants get established. A big branch has fallen down but we haven’t removed it as it’s offering some further protection to our revegetation.